Peel out, accelerate and prepare to gun it with the UNSC All-Terrain Mongoose. Build and recreate epic battle scenes between the UNSC and the Covenant with this authentic buildable vehicle! The UNSC Mongoose is the military’s ultra-light all-terrain vehicle capable of battlefield reconnaissance and high-speed assault maneuvers. 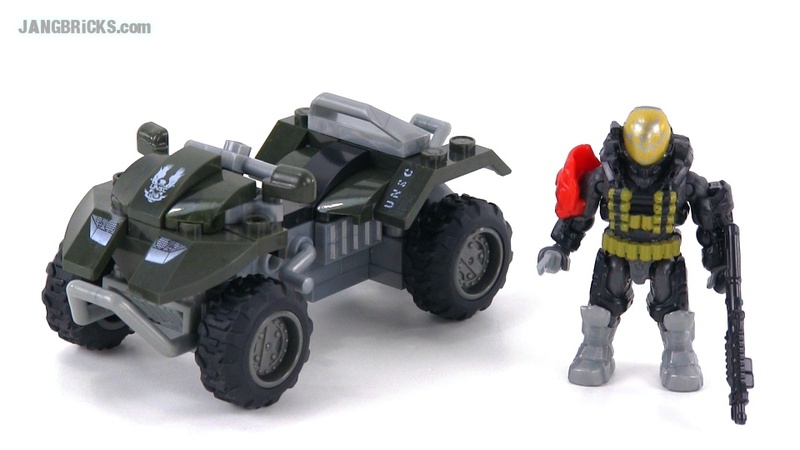 Includes an all-new super-articulated Spartan Emile micro action figure, with a customizable armor system. With his machete-style Kukri knife and Tactical Shotgun, Emile is ready for battle! Where do you get all these sets from Jangbricks? hey Jang. i seen you had an issue with the knife not being able to be on the arm. i happened apon this while looking at halo blocks on ebay. ouch, thats a nasty looking link. anyhow, i felt the same. just thought id show you.